Those of you who know Cameron really well know that he absolute LOVES those flannel blankets (the kind that you cut and tie in knots all around the edges.) My Aunt Karen gave him his first one when he was 3 months old as a Christmas gift--and it was love at first site. We used it to cover him with at night in his bassinet, and then in his crib....and one night, when he was about 6 months old, we noticed that he had the ties in his mouth and was sucking on them! It was the funniest thing. Cameron never has used a pacifier (much to my dismay on some days), even though Colin LOVED his paci, and has never sucked his thumb, like Ethan now does. However, he has a complete obsession with sucking these blankets! We now have several around the house. The one that my Aunt Karen made for me, the Illini blanket that you see in these pictures, is for some reason his absolute favorite. I think that might be because we keep it in the living room, where we spend alot of our time....so it is always accessible! 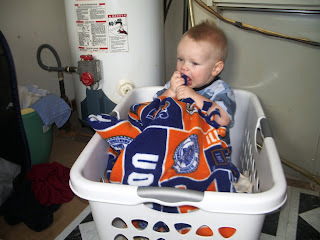 Well, the other day was wash day, and the blanket had been in Cameron's possession for a few days and needed it's semi-weekly wash, so I threw it in the laundry room in a basket. Our laundry room is right off the kitchen, and you can see right in the door, because I keep it open 90% of the time (isn't that how often I am actually DOING the laundry??) 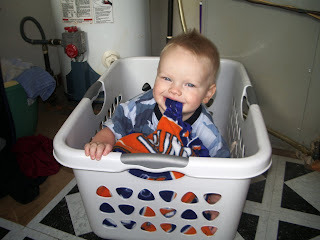 The boys were in the living room playing, and I ran down to put a basket full of clothes away in our bedroom. I came back a couple minutes later to find Colin playing all by himself. I knew Cameron couldn't have gone far, so I began looking around...not in the dining room, not in the kitchen....and then.....THERE he is! I found him in the laundry room, he had climbed inside the laundry basket containing the blanket, and was sitting in there sucking on the ties of my blanket! How funny is this kid? I quickly grabbed the camera and took a few shots of him before he actually saw me. He knew how funny it was too--he burst out laughing as soon as he saw me! I snapped another one of him laughing, and added yet another incredible "mommy memory" to the list. Thanks for the laugh Cameron! That is awesome, don't you love how different each kid is and what they love.